At Morrow Piano Studio, we offer affordable piano lessons backed by 30 years of playing experience and 20 years of teaching experience. Lesson schedules are highly customizable and we can work within your specific daily schedule. We accept students of practically any age and skill level - it's never too late to start learning piano! Few, if any, instruments are as versatile as the piano. Whether on a concert stage or at a jazz club, performing for friends or in front of an audience of thousands, playing it as a solo instrument or as part of an ensemble, band or an orchestra, the piano is able to rise up to any musical challenges and cope with most any music-related situations. Pianists are able to produce powerful waves of sound, loud enough to be heard over a full-size symphony orchestra and, in the next moment, bring out hushed, whispering notes. Lessons are given at our studio located in northeast San Antonio and are available mornings, afternoons and evenings, 7 days a week. Click here to view and purchase lesson packages. 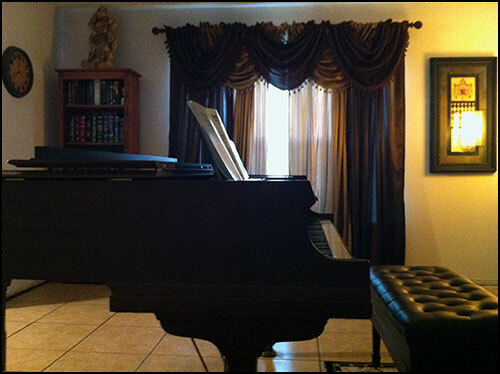 If you have any questions or need further information, please email info@morrowpiano.com or call 210-392-6599.